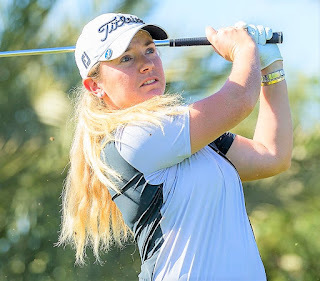 Marrakesh, Morocco – December 18: England’s Bronte Law posted a course record-equalling 10-under-par 62 in the third round of Lalla Aicha Tour School at Amelkis Golf Club on Tuesday, which included nine birdies in a row: an all-time record on the Ladies European Tour. With a 54-hole total of 13-under-par 203 in the 90-hole marathon qualifier, Law, pictured left, ended the day a stroke ahead of Sweden’s Linnea Ström, who posted the 10-under at Amelkis in pre-qualifying last week. Manon Gidali from France is three strokes further back on nine-under-par. Law lowered by two the previous LET record for the number of consecutive birdies in a round and tied the total number of birdies, with 12. The 23-year-old from Stockport said that her hot streak included a chip-in on hole seven and tap-ins on holes six and eight. Her new caddie, Jeff Brighton, from Scotland, provided significant motivation and she added: “Me and my caddie were bouncing off each other, saying, ‘What do I get if I make three more birdies?’ For every three in a row I get 40 dollars. "So then, he was giving me some banter about it and I had three more. Then he said, ‘Well if we get to seven, we’ll start talking real money.’ Then he said, ‘If you get to nine, then we’ll start talking even more money.’ I said, ‘How much money are we talking here?’ He joked around with me, which always makes it easier out there. “On the last three holes, he said: ‘For every birdie you make, I’ll give you £20.’ So I birdied two of the last three and made myself a little bit of money out there today. I would have made quite a lot of money in a skins game. It was good. I was playing some good golf and I started to hole some putts, which can make a huge difference. I was pleased with how I played. I played steady and it’s always nice to feel in control of your game. Another former PING Junior Solheim Cup player, who has The 2019 Solheim Cup in her sights, is 23-year-old Ström, who had a third round of 68 at Palm Golf Ourika. There is one more round to go before the field of 115 players will be cut to the leading 60 and ties. The final round will be played at Amelkis Golf Club on Thursday, when positions will determine playing categories for the 2019 Ladies European Tour. QUALIFY FOR THE FIFTH (FINAL) ROUND.